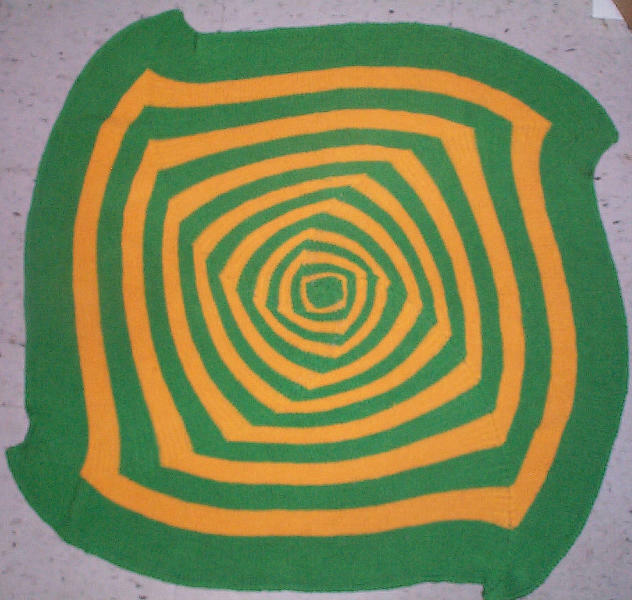 It’s about 47 inches across the center. I used about six skeins of green and five of yellow Austermann Record 210. I had begun another round of yellow but I didn’t have enough yarn to complete the next progression, so I ripped it back, opting instead to use up all available green for the outer, larger framing section. Obviously, I haven’t attempted blocking yet. Cotton yarn as a rule does not deform as well under blocking as does wool, and this dense cotton in particular has a mind of its own. I suspect I’ll have to pin this to within an inch of its life, then steam block it rather than just damp blocking. But that’s an exercise for another day. Even if I don’t get around to it, the odd shape (although unorthodox) isn’t unappealing. In other knitting news, I continue to slog away at the spiderweb section of my growing olive green tablecloth, but pix of the standard indistinct and blurry snood shape object won’t reveal much beyond the fact that it still exists. Also I was tempted too long by the skein of Noro Kureyon Sock Yarn that’s been sitting atop my monitor since I posted about its acquisition back in July. I had thought about doing something unusual with it rather than just socks, but the lure of those colors proved too strong. For the record, I’m using 00s, and am working at the relatively large gauge (for me) of 8 stitches per inch. Although I usually prefer my socks knit tighter, this yarn is a bit heavy compared to the sock yarns I usually use. It’s also a single, with a fair bit of unevenness – some parts are thinner than others – and a fair bit of overtwist. The overtwist can be a pain because the yarn will kink up on itself if a long section is drawn from the skein. 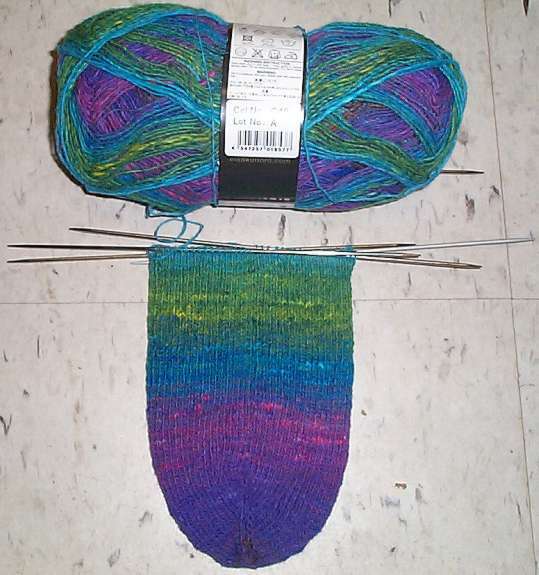 I’ve also noticed that other knitters have complained about Kureyon Sock’s feel, thinking it a bit on the coarse side. It is hard on the fingers as it is being knit, but the resulting sock at my gauge is nice and cushy and feels much softer than palpitating the skein promises. This pair won’t be finished any time soon. Now that the first sock has been kicked off, I’ve relegated it to “briefcase project” status. That’s the small, portable project I keep on hand to knit at doctors’ appointments, while waiting on line at the post office, and other stolen oddments of time. My socks will be done. Eventually.